20/20 For Free? Roll Up Your Sleeves! 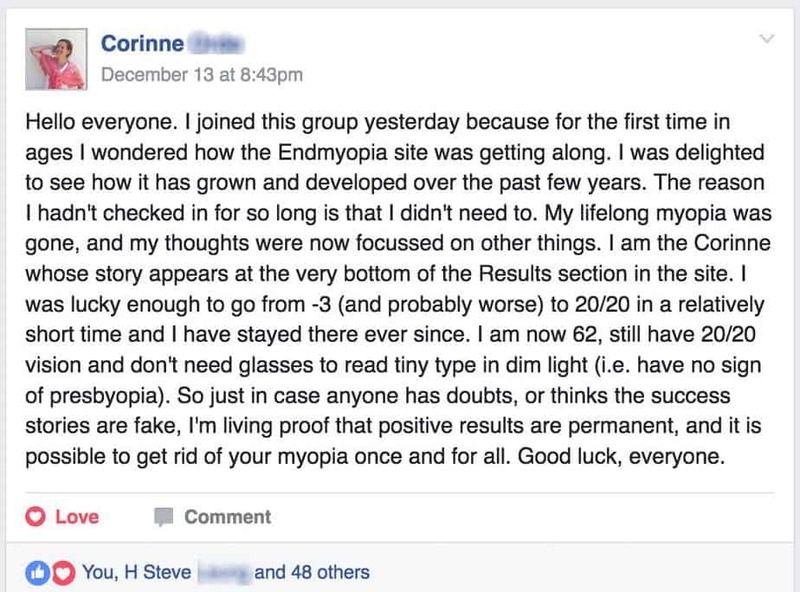 It can be a challenge, just starting out, to wrap ones head around endmyopia and real vision improvement. There’s just a lot to take in. Important here is to take your time, keep reading, keep learning, realize it’s like a big puzzle – and it takes time to put enough pieces together to see the whole picture. Counting 146 individual articles, as of this writing. These includes topics from BackTo20/20, my experiences, others experiences, one hundred forty six opportunities to get a wealth of knowledge on improving your eyesight – entirely for free. Is it possible to find what you need to know, in these guides? We’ll get to that, in a moment. What you might call “prescriptions”, we discuss in this category of currently 107 individual posts. This covers just about every question I’ve encountered – and remember to write about – from the past decade (and new questions are being answered by me continually here). This covers student questions and BackTo20/20 member questions and Facebook group questions, any and all questions about how many diopters you may need. Where else on all of the Interwebs are there this many detailed guides discussing diopters and glasses? 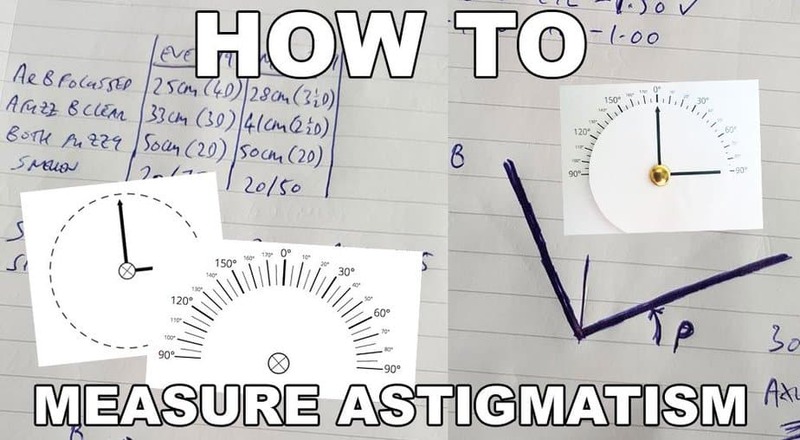 Astigmatism is technically part of diopters and focal planes, the category above. To make it even easier for readers though, I separated astigmatism specific sub-topics into its own category. We’re seriously going all out here, providing a mountain of guru-worthy content, in minute categorizations. Low myopia as its own separate topic, from the how-to guides in general. So you know, if you’re looking at how-to guides, you don’t have to feel all exasperated and ready to fire off a huge complaint e-mail, telling Jake that by all the gods, why are there high myopia topics mixed in here? I don’t have high myopia, Jake. Duh. Don’t make me sort through all this. So indeed, thinking of all the readers, we separate out low myopia specific guides into its own category. Sort of like you would if you were offering an expensive paid product, offering as much value and convenience as possible. But what about the children, Jake? Yes it is. It’d be perfectly fine to just have myopia how-tos. But then an eye guru learned over the past decade, that kids are a funny animal. Different motivation. Different psychological considerations. Different things to consider at different age brackets, and different reactions to diopters when the eyes and visual cortex are still developing. 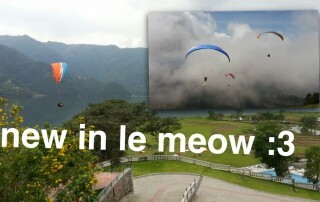 So here too, its own category. 41 individual posts. Because what less should anyone expect, with free sagely advice? Besides the separate FAQ section, there’s an entire blog category dedicated to just questions and answers. Things that don’t fit any of the other categories, or things that tend to be common questions, often end up here. The sort of thing you’d expect within a paywall of a product you just spent a bunch of money on, providing Q&A that’s continually updated. Except that this is free. Not all, though. Because some will ask, how does all this even happen? Where’s the science, Jake? There’s of course the whole “start here” part of the site, with links to PDFs of published research material, of detailed reviews of studies over several decades, of all the things to get you started on your own research (on Google Scholar because convenience). But that’s not even all. We also have a separate section on the blog, just for science discussion. Also Jake, what about video? 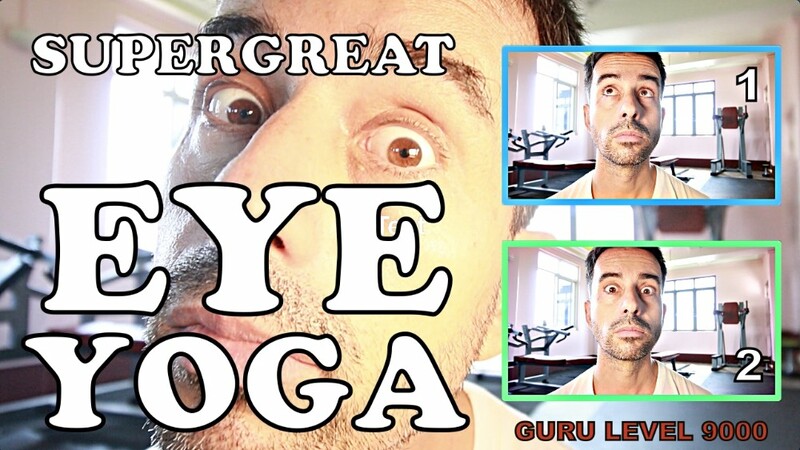 Putting ones gorgeous, youthfully radiant guru face on video, right out there to become prime troll target, that was a real stretch. But people wants it. Alternate ways of consuming information. So there are 62 posts pointing to endmyopia video, just a part of the current 120 or so library of videos in endmyopia’s Youtube channel. Granted here the value is somewhat questionable, just think of it as a work in progress. Is that enough yet, as free things go to help out? Of course it isn’t. 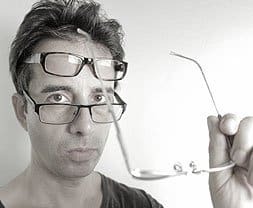 We could look at the 81 articles discussing various questionable therapy methods, 177 articles with news and updates on endmyopia as a project, 15 articles dissecting just Bates method, 16 articles discussing the problematic practice of LASIK surgery, 171 individual detailed student reviews, 78 articles discussing BackTo20/20 course materials (available for free), and 181 vision health related articles (some duplications here with other categories). And there’s still more, but really, enough with the horse. 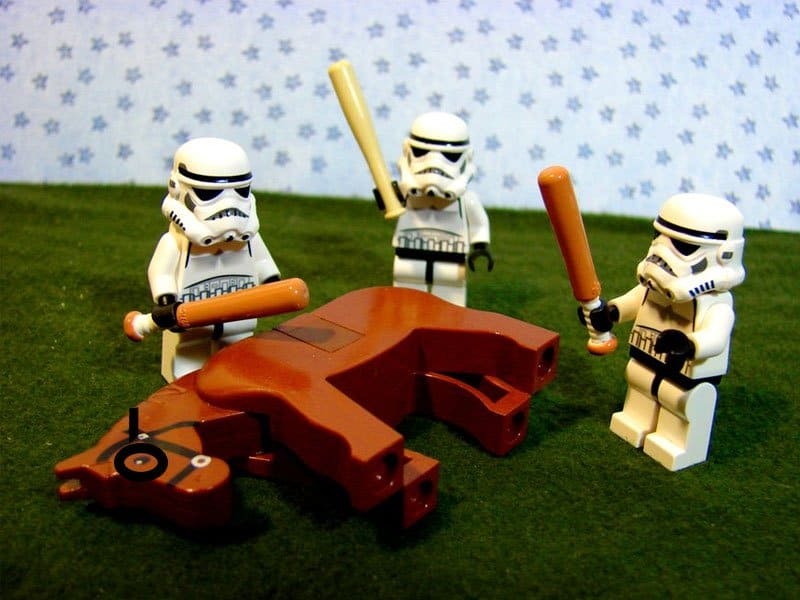 I believe he’s down, sir. This may be a longer response than you intended to your simple question, but I have been wanted to write to tell you “thank you” for quite some time. I am one of those people who has been a life long glasses wearer (since 3rd grade) and my “over” eye correction peaked on July 1, 2015 with OD -2.25 Sph., -4.25 Cyl. x 4 and OS -3.50 Sph., -4.75 Cyl. x 168. Last October I was fed up with ever worsening eyes, and went to the “trusty” Internet to see what I could find in the way of science in naturally improving my eyesight. I found the common Bates Method, binaural beats/subliminal messaging, but thankfully I also quickly found your website and YouTube videos. Being an engineer, I really liked the actual white paper research to back up your methodology, as well as ways to quantify improvement. 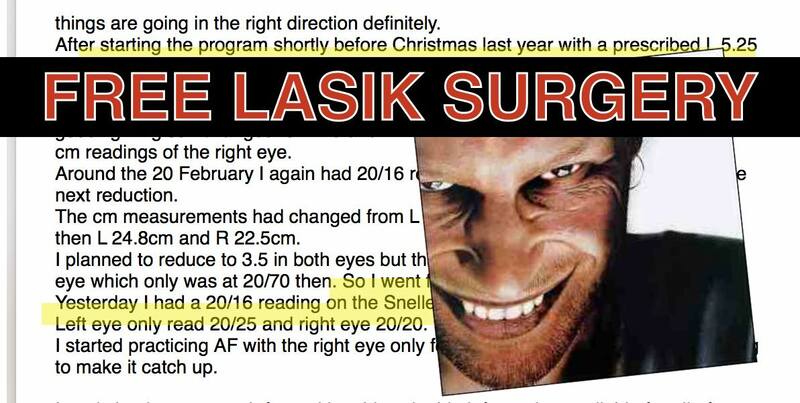 On October 10, 2016, I started taking centimeter measurements and measured edge of blur at 18 cm (-5.5) in my left eye and 20 cm (-5) in my right. I immediately signed up for your 7-day email guide and read every bit of the messages. At the end of it, I didn’t pull the trigger on signing up for the program because I am expecting twin girls (#2 & #3) and am saving as much money as possible. Also, I am a bit of a “do-it-yourselfer” and was willing to work through the blog to glean the knowledge (especially since you said all the information can be found within it). For the first several months I was reading three to five blog posts a day. My centimeter measurements increased to 40 cm (-2.5) in my left eye and 52 cm (-2) in my right. 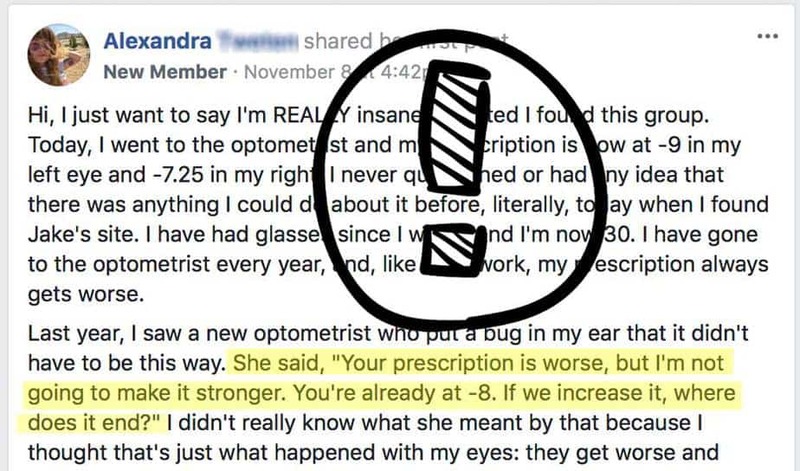 Also, for outside verification I scheduled a visit with an optometrist.who gave me an eye correction recommendation of OD -1.50 Sph., -2.75 Cyl. x 180 and OS -3.00 Sph., -3.50 Cyl. x 163 for 20/20 vision! As you can see, this is a huge improvement over the aforementioned lens strength that I had been wearing. Considering my goal is 20/40 – 20/50 and the fact that the optometrist had me in a dark room, I decided to buy glasses from Zenni Optical with OD -1.25 Sph., -2.25 Cyl. x 180 and OS -2.75 Sph., -3.00 Cyl. x 163. After wearing these glasses for close to three months, i can already see better than 20/20 during the day, and almost 20/20 at night. Therefore, I just ordered a new pair of glasses with 0D -0.75 Sph., -1.50 Cyl. x 180 and OS -2.25 Sph., -2.25 Cyl. x 163. It was a little more of a reduction than you typically recommend, but I have just been so excited with the improvement that I know I will be seeing 20/20 with these by the spring or summer. The next pair of glasses I purchase this year will be to work on equalizing my eyes (removing focal plane complexity), by stepping down my left eye with minimal changes to the correction in my right. My hope is to go back to the same optometrist this fall with much better vision. The reduced correction in my lenses in combination with moving my monitors farther away and using Iris seems to have allowed by normalized glasses to also be my differential ones. It seems like I am having to active focus for computer work, but this may not actually be the case and I still need to test overlaying plus lenses over my glasses to see – no pun intended – if I can and should have further reduced lenses for close up work. I will test this theory with both my current glasses and the new ones I just ordered. Thank you very much for the work you do! It has been immensely encouraging to see my astigmatism double-vision decreasing and my vision improving! Also, on sunny days it is neat getting glimpses of crystal clear vision (https://endmyopia.org/flashes-clear-vision-explained/) at distances much farther than my current sphere/envelope of clear vision. As of today my centimeter measurements are 48 cm in my left eye and 53 cm in my right. Below is an image of my tracking table and graph. You will see a lapse in measurements during the holidays, but I am back on the bandwagon and tracking once again. Add that to the free reader improvement report category, which I entirely didn’t include above. Let’s get productive and start thinking success. And when you get there, engaged and making progress, join us in the Facebook group to discuss questions and nuance and ideas and feedback. Start getting your own 20/20 gains! Footnote: Think the site could be even better? Feel free to volunteer working on specific improvements, offer helpful and constructive nudges, realizing it’s always a work in progress!